(BGO) – The Bac Giang provincial Museum and Center of Culture and Cinema on May 13 – 14 exhibited and introduced the cultural heritage of Then singing of Bac Giang based Tay and Nung ethnic people in the sixth National Festival of the art of Then singing and Tinh gourd lute of the Tay, Nung and Thai ethnic groups held in the northernmost province of Ha Giang. The performance of “three-wire Tinh gourd lute” presented in the Festival by the musicians and performers of the Bac Giang provincial Center of Culture and Cinema. 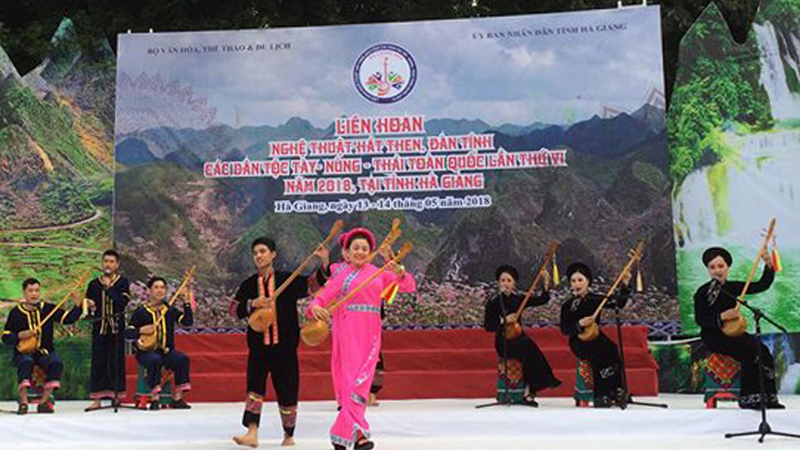 The event was organized by the Ministry of Culture, Sports and Tourism, gathering artisans from the 14 provinces and cities nationwide, including Ha Giang, Tuyen Quang, Cao Bang, Bac Kan, Lang Son, Thai Nguyen, Bac Giang, Quang Ninh, Yen Bai, Lao Cai, Son La, Dien Bien, Lai Chau, Dak Nong and Dak Lak. A wide range of activities was performed in the festival such as singing Then folk songs with Tinh gourd lute, displaying Then rituals, showcasing booths with products and culinary, exhibiting Then cultural heritage, introducing traditional craft of weaving brocade of the Tay, Nung and Thai ethnicities. Bac Giang troop promoted various images, documentaries, materials, instruments, costumes, offerings and books relating to Then folk singing and signature culinary of the Tay and Nung peoples in the province while the local artisans, musicians and performers presented some unique Then melodies.